Robbie had been Douglas Adams’ business partner and on his death endured the grieving process so individual to each of us, yet so universal to all of us. Some years later he was asked to take part in an interview where the team had constructed essentially a mix-deck of various sound recordings made during Douglas’ life, and Robbie was asked to engage in conversation through microphone and headphones with the bite-size Douglas’ recordings. I remember Robbie telling me about his experience that day, and how he recalled the moments of ‘true connection’ in the conversation. At times, he felt as if Douglas was even present. At other times, no doubt – the sound engineers missed the mark, and the interaction was clearly contrived. Perhaps none of this should come as a surprise, nor did it particularly to Robbie; but what was interesting was how he described the moment the headphones came off. He felt a sense of true loss, and even though it had been many years since he had last grieved for Douglas – those feelings flooded back. What Robbie experienced that day was a forerunner of the Digital Persistence experience that was portrayed in the Charlie Brooker TV show “Black Mirror”, (Season 2 – Episode 1). In this episode, the protagonist’s boyfriend is killed in a traffic accident and a well-meaning friend suggests she engage with a chatbot system that harvests all of an individual’s digital breadcrumbs and can construct text in the style of the deceased. Of course, during the episode, the technology advances; as does the protagonist’s willingness to experience it. What started as a chatbot, becomes an Alexa style interactive voice, and eventually a fully embodied synthetic reproduction of the original person. The episode helps us explore where we as individuals cross the ‘creepy line’ – what seems like innocuous technology at the outset, suddenly develops a sinister quality. I hope so too, Frida – but it seems that there is a qualitative difference between a Virtual Reality ABBA concert and a VHS recording. One is essentially a representation of that which is past, the other – albeit synthetic, a living thing in its own right. As the technology develops to capture the interactions of the audience and respond to the mood, requests, actions of the virtual reality participant – so it too is likely to cross the creepy line. 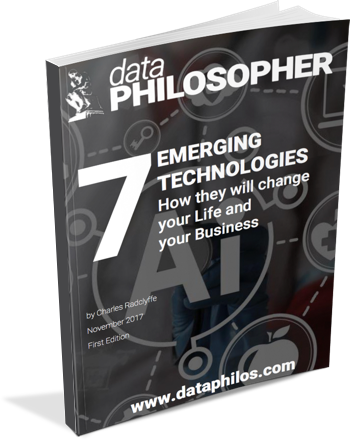 All these technologies form part of a category known as Digital Persistence, the ability to preserve the essence of who you are so that others, after you’ve gone – can see you how you were; or perhaps even, how you wanted to be. Taking this further is the nascent area of ‘whole-brain-emulation’ and ‘mind-uploading’. While still beyond the clutches of even the latest advances of the tech industry, the premise of these technologies is that the deceased’s brain might be scanned and recreated in a digital form – the idea being the digital replica would function in exactly the same way as the physical original, and the memories and personality of the deceased would be preserved forever. To me, it’s the ultimate expression of hubris for technology to be developed along these lines without a complete engagement with society as to whether it should exist or not. It’s an interesting scientific point to discover whether or not it is possible to achieve, but to do so without careful consultation is likely to cause more harm than good. It is also striking that the groups and organisations most qualified to speak on the subject of the afterlife – i.e. religious organisations of any faith or denomination are simply not consulted on these matters. What we’re at the beginning of is the start of tension building that at best will make a great Dan Brown novel plot, but at worst could see the West thrown into the scale of intellectual chaos last seen in the Reformation. What of eternal youth? Well, if the classics have taught us anything, it’s to be careful what you wish for. Since the dawn of time, our existence has been shaped, defined even, by our mortality. Our finite life spurs us on to take risks, to seize the moment, live life to the full and be content with what we have. If eternal youth was bestowed on us, would we all be too paranoid and fearful to leave the house lest falling victim to a falling tree, or passing car? One thing is certain. It is our generation that needs to decide whether technology should have limits, and to define if so, where those limits should be. This is not a conversation that should be discussed in labs and research centres, but more widely; by poets, priests and politicians too. Interested in the effects of technology on society?